With the many advances that we’ve seen with respect to air and water economizers for data center cooling systems (usually called free-cooling chillers in Europe), it’s no exaggeration to say that no matter where your data center is located on the planet, it can take advantage of economizer solutions to reduce cooling costs – in some cases dramatically – along with your carbon footprint. The graphic below illustrates the point for a chilled water system, based on water economizer with an adiabatic system. 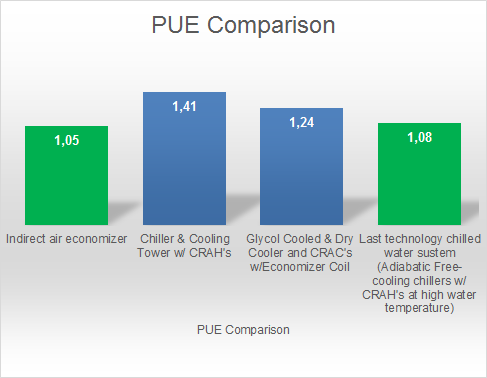 It shows the gains to be had from using newer economizer cooling systems vs. traditional systems, along with employing three techniques: a relatively high supply chilled water temperature, up to 20°C to the data center air conditioners (a topic we covered in a previous post); a greater differential between the chilled water supply and return temperatures, known as the delta T; and an integrated adiabatic system for the heat exchangers. 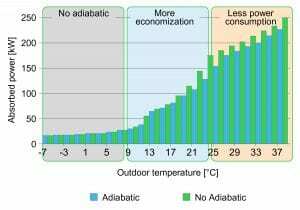 In particular, the adiabatic system reduces the energy impact both in summer and in mid-season more, operating for the large part of the year. Let’s take Paris as an example. In the graphic, we’re comparing a data center in Paris that uses traditional water economizer units and a typical delta T of 6°C (incoming chilled water of 18°C and outgoing at 24°C) with the same data center using a delta T of 10°C (18/28°C) along with a new water economizer solution, known as adiabatic or evaporative cooling. The combination of the two provides a 22% increase in energy efficiency – a number that means huge dollar savings for a large data center. Based on the chart, savings can be realized anywhere on the globe, even in temperate climates such as New Delhi or Buenos Aires. What’s interesting is you can also get savings in colder climates like Moscow, even though data centers in such areas already benefit greatly from traditional economizer systems that rely on cold air. Why is this? 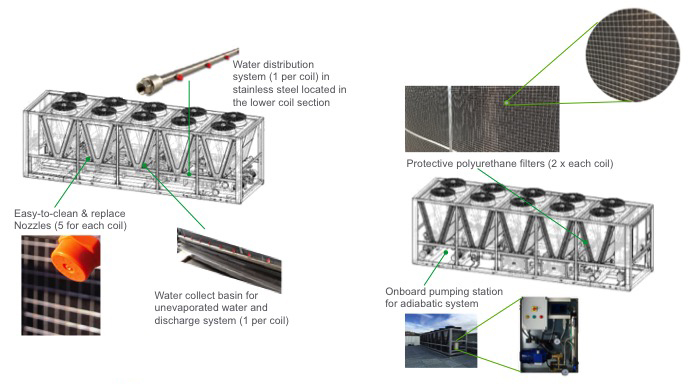 Adiabatic systems leverage water evaporation to reduce the temperature of the air, thus improving unit efficiency, regardless if it is an air economizer or a free-cooling chiller. It’s the same principle that makes you feel chilly when you come out of the water at the beach – as water evaporates, it takes heat away from you. In water economizers, the adiabatic process involves use of nozzles positioned over air economizer coils that essentially shrouds them in a fine mist, like a fog. As the mist evaporates, it takes heat with it, cooling the refrigerant and the water inside the coils. (Speaking of which, changes are coming in the refrigerants we use in data center cooling systems, as I discussed in this previous post). 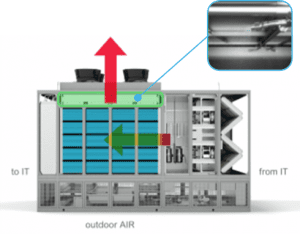 In air economizers, the evaporative process is based on keeping the air-to-air heat exchanger wet, maximizing the natural thermal exchange between the air from the data center and the outdoor air without mixing. An embedded control system monitors and controls the operation. In short, it only uses water when needed for additional cooling and can also use auxiliary trim cooling when necessary, to deal with high temperatures or humidity. By taking advantage of variable speed drive technology that optimizes cooling capacity to exact requirements at any given time, companies can save even more on data center cooling costs (learn more about that in this previous post). 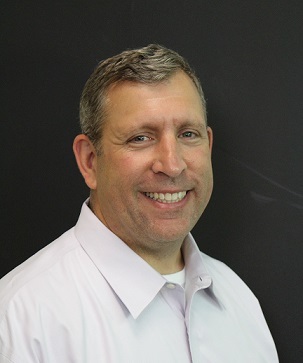 Large and hyperscale data center owners are always looking for a way to save even a single percentage point in energy consumption, because it translates into millions of dollars over the years. They’re also rightfully concerned about lowering their carbon footprint, which relates not just to electricity, but water consumption, to optimize the total cost of ownership. Just considering energy usage, it is possible to use the pPUE (partial Power Usage Effectiveness), a well know parameter to identify and compare the efficiency levels of different technologies. The diagram below makes clear how the more an innovative approach is used in data center design, choosing the latest technologies, the lower the pPUE can be, resulting in a huge impact on data center efficiency. Adiabatic cooling systems such as Schneider Electric’s EcoflairTM fit the bill on both fronts, by reducing both energy and water consumption. To learn more, visit our Ecoflair Air Economizer site to access additional resources and white papers. Also, check out the interactive model for Ecoflair and other cooling solutions.